Pompey's new owner Balram Chainrai took charge of the club for the second time but said he will not be making any 'rash promises' over its future. Mr Chainrai, his brother Deepak and Israeli businessman Levi Kushnir were yesterday officially announced as the club's owners after Pompey came out of administration late on Saturday – to the relief of fans. Pompey chief executive David Lampitt said the deal marked the start of a new period for the club. But Chainrai, who put the club into administration in February this year, did not reveal whether he will be at Pompey for the long-term. The Hong Kong businessman, who has previously stated his desire to sell the club, also revealed he needed to 'borrow money from elsewhere'. He said: 'We are very pleased to have finally completed the sale process. 'We look forward to working with the senior executive team and the football manager, and to be part of the rebuilding process of this historic club. The takeover came after a tumultuous weekend for Pompey which threatened to see the club slide into oblivion. On Friday evening the club issued a statement saying former owner Sacha Gaydamak had put the club at risk of liquidation after being the only secured creditor not to sign an agreement allowing Pompey to be sold to Chainrai. Gaydamak denied he was holding up the process, blaming the club for the deal changing at the last moment. But he eventually signed the agreement meaning Pompey could exit administration. Now the old company has been wound up and a new firm will run the club – to be named PFC 2010 – under the control of Mr Chainrai. Gaydamak, who will be repaid 2.2m over five years, still owns land surrounding Fratton Park. 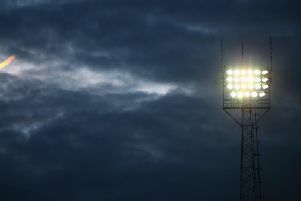 The takeover means the Football League has automatically lifted a year-long transfer embargo, which meant the club had to approach the league each time it wanted to buy, sell or loan a player. Manager Steve Cotterill will have more freedom to expand his squad, though any new deals would need to be approved by the league. Pompey, who won 2-1 at Hull on Saturday, will also be required to provide monthly reports to the board as it keeps an eye on the club's financial affairs. Pompey chief executive David Lampitt told The News: 'I do see this as just the start. We've come to the end of administration, but this is the start of a new period at the club which is equally as important. 'We've just got to take stock and we've got to get to know the new owners, and they've got to get to know us. We have got to help them understand the business of the football club and what it means for the city. In doing that, we have the right way to take the club forward and that is absolutely what we want to achieve. He also praised the fans for their 'incredible support', adding: 'It is a huge relief to come out of administration because the future of the club has been in jeopardy for a long time. It is a significant moment for everyone involved in the club, and we are now in a position where we can look to move forward on a more stable financial footing. Mr Chainrai is known to most fans as the Nepalese electronics businessman owner of Portpin, the company that put Pompey into administration in February. He is a British citizen based in Hong Kong. Mr Chainrai's main company, Hornington, was founded in 1984 to make electronics and toys, distribute computers and to provide funding to other business projects. Hornington also owns a string of fitness chains in Hong Kong. Not so much is known about Deepak Chainrai, Balram's brother. He is a Finchley-based businessman who runs a property company called Hornington Investments, linked to his brother's Hong Kong concerns. After Balram placed Pompey into administration, Deepak would often be seen at Fratton Park representing his brother. Mr Kushnir is Balram Chainrai's business partner; they jointly run Portpin. The Israeli property developer's other business interests include Gmul Energy, Nechushtan Investments Ltd, Tadiran Ampa Ltd, Ameris Holdings, and the Petro Group.